Add a touch of vintage style to your axe with these three-per-side tuning machines. 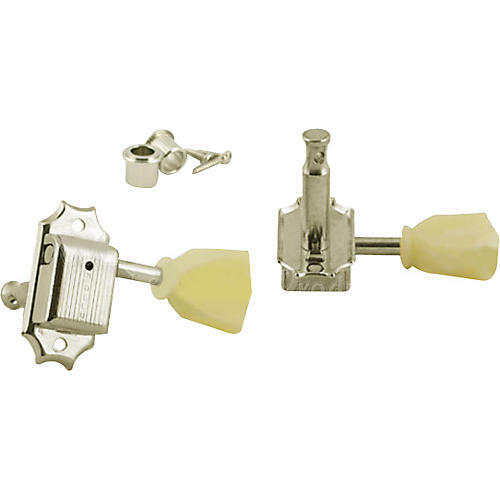 These Kluson tuning machines were used on vintage Gibson guitars such as the Les Paul, SG, ES-335 and others. They're also used on the Epiphone Casino and current Epiphone production of Les Paul and G-400 (SG) models. This model of Kluson tuning machines is also a direct replacement for all current reissue 50's and 60's Gibson production and other series that use a vintage style individual tuning machine. This kit comes with six individual tuners, 3 per side (that are not on a plate). All hardware including bushings and mounting screws are included in the set. Please note: If you are retro-fitting a vintage instrument that has been modified or putting this vintage-style Kluson tuner on a modern instrument you may also need to purchase "adapter bushings" (sold separately) to convert a larger size peg hole to vintage size to allow for proper fit and function.